Emil Frankel ’61 thanks and congratulates Sarah Wildman ’96, who presented the 36th annual Samuel and Dorothy Frankel Memorial Lecture, which honors his parents. 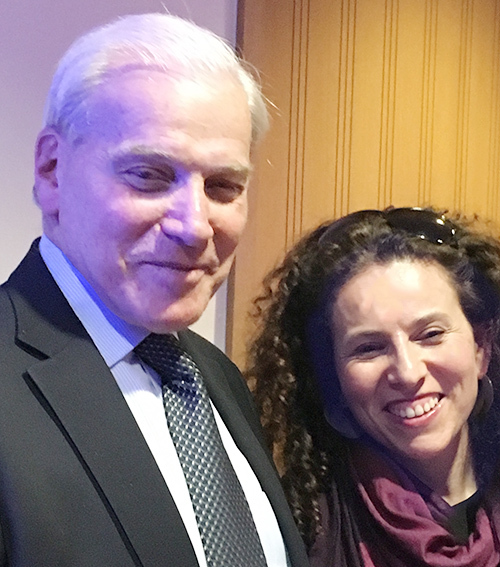 Sarah Wildman ’96, an award-winning writer and regular contributor to the New York Times, presented the 36th Annual Samuel and Dorothy Frankel Memorial Lecture on April 5, in the Daniel Family Common at Usdan University Center. The event was sponsored by the Center for Jewish Studies and organized by Dalit Katz, director of the center. Wildman spoke on what she’d learned about the Holocaust in writing Paper Love: Searching for the Girl my Grandfather Left Behind (Riverhead Penguin, 2014). The story began for her, she recalled, when, after her grandfather’s death, she came across a box that had been his, containing dozens of letters from a woman named Valy—or Valerie Scheftel—addressed to her grandfather. It was clear that the two, who had been medical school students together at the University of Prague before World War II, were sweethearts. When Wildman’s grandfather and family fled Europe, Valy had remained behind. “Oh, that was your grandfather’s true love,” her grandmother told Wildman when she’d asked. Wildman realized then that the comforting story she’d heard as a child—that their family had all escaped together—was not entirely true, and she began searching for this woman whose story remained only in a box of letters. Wildman detailed the search with her Wesleyan audience—the libraries visited, the letters read and researched, and the visit to the International Tracing Service in the far western point of Germany. At this repository of everything the Allies had gathered when they liberated Nazi territory, Wildman found that someone else had been looking for Valy, as well. She finally meets the youngest daughter of this searcher in England, and learns much more of the context. “As naive as it was to think my grandfather had escaped with everyone, it was also naive to think I could tell a story about a single person without trying to understand the community she was living in,” Wildman said. When asked about Valerie’s fate, Wildman demurred. “I don’t like to talk about her fate when I talk about the book. I find that we flatten the experience of the war into the final outcome,” she said. “What I really wanted to do with this book is actually look at the day-to-day and really dig in to what it would mean to be a woman, a professional, someone who doesn’t necessarily want to get married, who sounds completely modern, who just wants to be recognized as a doctor….